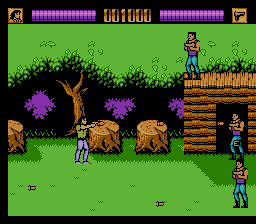 The second attempt at a Lethal Weapon game by Ocean Software did not come about until March of 1993. This time, development was passed to another British software house, Eurocom Entertainment Software, a company that also have a prolific reputation for mixed quality tie-in games. 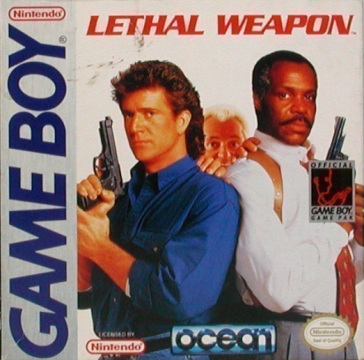 Their version of Lethal Weapon went with a completely different direction with their effort, and was released on the aging NES and the handheld Game Boy. Whereas the contemporary consoles got an action platformer, the NES and GB received a wonky, overly difficult, mediocre beat-em-up. It’s a single player experience and the manual, again, boasts that there strengths and weakness to the two main characters. Where this differs is that Eurocom actually delivered on that boast. Riggs is much more agile, he can jump higher, uses a weak “Martial Arts” kick as his melee attack, and can pick up and throw knives. Murtaugh, on the other hand, is slower and cannot jump as high, but has a strong punch melee attack, plus he can pick up and throw crates. 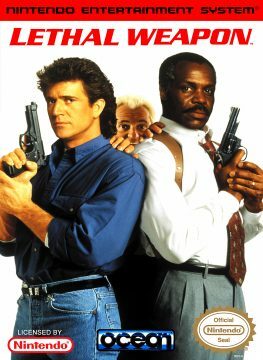 Riggs can jump over some obstacles and Murtaugh has to punch his way through the same obstacles. In this version, Eurocom redeems themselves with the character switching mechanic, which is quite useful. To switch between the two heroes, the player walks to left screen and can continue with a revitalized character at full health, while the unused character rests off screen. This is a godsend, as the game is brutally hard from the get go, even on the lowest setting. This does, however, serves to further remove the “Buddy Cop” aspect, as it makes the dynamic of the two character feel like a wrestling tag team rather than being crime fighting partners. While this may be excusable on the Game Boy for its limited hardware, it is inexcusable on the NES, which had more complex two player co-op games like the Contra series, released years before. Riggs “Martial Arts” kick can down a default enemy in five or so hits, but Murtaugh’s punch can defeat an enemy in 2-3 hits. Both characters have limited ammunition foe their guns and enemies tend to go down after one to two hits. This is all exciting on paper, but the combat is quite dull and repetitive. Like most beat-em-ups, the goal is to move forward and stop periodically to fight some bad guys, but there is no nuance, variety or weight to the combat or enemy types, as they’re all the same apart from the weapon they wield. To add to this lack of variety, they have no strategy or attack patterns. They come at the player like mindless tanks, taking damage until they collapse, all swarming the player. The experience rings hollow, and it’s even more unfair as you are likely to take massive damage in the process. Plus, there is no way to dodge and player’s hit boxes are very large. Occasionally, a helicopter will show up to add spice to proceedings, but it only takes two extra hits to down – it also leads to an hilarious moment were Murtaugh can punch a helicopter to death! The bosses are also deeply unoriginal, for example: a fat man, a kung-fu guy with no shirt and a man in suit, and they act the same as regular baddies, just with more hit points. They also have no attack patterns or weaknesses for the player to exploit. The music is serviceable. 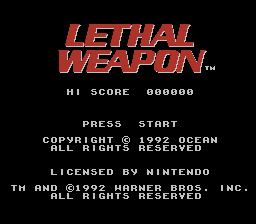 The title screen theme sells the idea that you are the law, and you are there to clean up the mean streets in a bombastic action orientated fashion, but it does not feel like a Lethal Weapon film – it would be extremely difficult to replicate the film’s soundtrack on the NES and GB sound chip (and the previous games also didn’t even try). But it is a great tune nevertheless. The in-game music however, is very generic and tends to wash over you like white noise. It does have a fast tempo that complements the action, but lacks an identifiable hook to make it memorable. 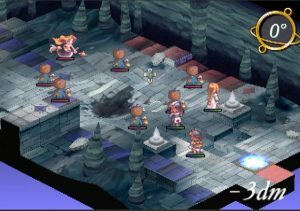 Like the other efforts, the graphics are cartoony in style, although the character sprites aim more on the side of realistic, and they are less exaggerated like the other versions. Both the NES and GB versions use the same sprites and backgrounds, but the graphics look nicer on the GB because of the coloring. The GB version iends up being preferable because the view is so zoomed in and in monochrome, the sprites and backgrounds tend to blend together better. Whereas the NES version, with its wider play field, has muted colors for the majority of sprites but garish neon colors for the background. Rather than, say, the subtle tones of Data East’s better looking RoboCop. 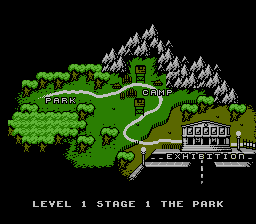 The NES game is comprised of three levels, split into three stages, where as the GB is split into five stages that are a small mix and match of the NES areas. Again, the plot borrows ideas from all entries and turns them into single missions. For example – the second stage of level two involves terrorists attempting to move the character Krugerrand out of the country via the docks, mirroring plot points from the second film. Only on the third level does the game borrow much more concise plot details from the third installment. with the inclusion of defusing bombs in a car park, as well as the game’s final boss. Apart from that, most missions are made up of generic action movie tropes from the era. At the time of release, both versions received very negative to mediocre reviews. The game was criticized for shoddy collision control and for not capturing the feel of the films in any way, shape, or form. It was one of the few NES and GB games that Nintendo Power awarded low scores to – the NES version scored the lowest with a 2 out of 5. While better in conception than the Ocean Software version, Eurocom’s Lethal Weapon falls apart in execution. It’s a terrible representation of a great franchise of films and is best left forgotten, along with the rest of the mediocre tie-ins that were spawned as cash grabs in this era. An SMS version was seemingly planned, but the only known evidence is the existence of the soundtrack, composed by Jeroen Tel, which has been publicly released.